Using hay or straw in the garden can be a touchy subject! Some gardeners swear that using hay will ruin your garden and turn it into a bed of noxious weeds. Other gardeners are afraid to use straw because there may be persistent herbicides sprayed on it. Who knew that using hay or straw in your garden could be fraught with such dangers? Well, it is very important to know what you are putting in the garden where you grow your food! With so many gardeners creating straw bale gardens or using straw as mulch, you would think that straw in the garden is a no-brainer! But before you go looking for bales of straw or hay for your garden this spring, let’s take a look at the best sources and how to use it. What is the Difference Between Hay and Straw? Hay is dried plant material such as grasses, clover, or alfalfa that is cut for animal feed. Hay is nutritious and contains many vitamins and minerals to help sustain livestock during the winter when they can’t graze for sustenance. Straw is the dried stalks of grains left over after a farmer combines the field to harvest wheat, oats, barley, or rye. Straw has very little nutritional value for animals, or for your garden. Find out if straw or hay has been sprayed before using in your garden. Conventional farmers use herbicides to reduce weed growth in their fields. Because of this, it is very important to ask what has been sprayed on the hay or straw and how long ago the crop was treated. It is very important to avoid those labeled as persistent herbicides in the pyridine family. These chemicals take so long to break down that even manure from animals that consume the crops sprayed with them can cause your broadleaf vegetables to wither and die. Read more about the dangers of these persistent herbicides in The Hidden Dangers of Straw Bale Gardening and Garden Mulch – Straw – Does it Have to be Organic to be Safe? Weed seeds can also be a problem when using hay or straw in your garden, but this is an easier issue to deal with than the fallout from persistent herbicides. To kill weed seeds, leave bales of hay or straw outside and allow weeds to sprout and die before using in the garden. Another potential problem with using hay or straw in your garden fungal infections that may occur when rotting mulch comes into contact with plant stems or leaves. Try to leave a few inches of space around plants to prevent this. Rake leaves in the fall to use as muclh in place of hay or straw. Whenever possible I use organic straw or hay in my garden. I would rather pull weeds than use toxic chemicals on my vegetables. However, it isn’t always possible to find a source for organic hay and straw. When using sawdust, wood shavings or wood chips, you may need to use more nitrogen fertilizer in the garden. As wood decomposes it ties up nitrogen in the soil so that it isn’t available to the growing plants. There are many different ways to use hay or straw in the garden. Both of these products break down and add organic matter to the soil. This helps to make clay soil more friable and fluffy, and sandy soil holds moisture longer when organic matter is increased. In addition to adding organic matter, or humus, to your garden soil, hay or straw may be used as mulch, for protecting tender seedlings, or for creating cold frames, garden paths, straw bale gardens, or new garden beds. Let’s take a closer look! Straw bale gardens have been quite the rage for a few years now. A quick search online will yield many different designs and methods of creating these labor saving gardens. The general idea is to purchase straw bales, place them in rows so that the cut side is facing up, put some soil down the center of the row, and allow the bales to decompose somewhat in the rain and sun. Once the straw has started to rot down a bit, you plant your vegetables in the soil row. Hay and straw both make a great mulch in the garden as long as they weren’t treated with persistent herbicides or contain noxious weed seeds. A deep layer of straw may be used to create a path through your garden or yard. Use one or two layers of cardboard or newspaper under a thick layer of straw to create a weed barrier that should last all season! One of the nice things about making a straw path through your garden is that it may be moved if you change your mind. It’s easy to put a straw path down and costs less than purchasing bricks or pavers for a permanent path. Creating a cold frame from straw bales and old windows has quite a benefits. Bales of straw used to form the walls will insulate the plants inside from cold weather much better than lumber or glass. At the end of the season you can use the straw as mulch, for creating a garden path, or till it into the soil. 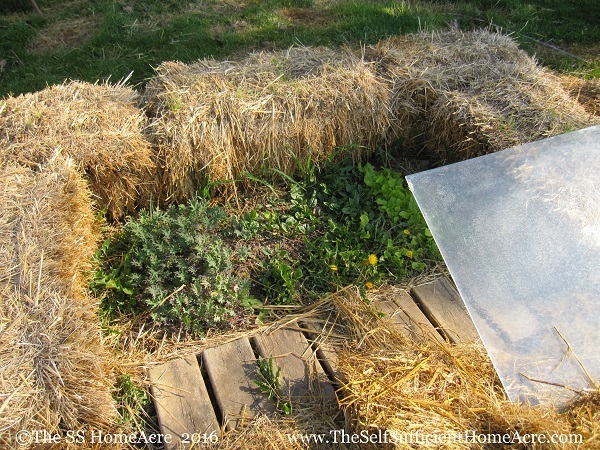 There are quite a few ways to arrange your bales for the sides of a cold frame. The size and shape of the cold frame will depend a lot on the size of windows used for the glazing, or clear top of the cold frame. Because hay and straw are natural insulators, you can use it to help protect tender seedlings from temperature extremes. When seedlings are first planted they can’t tolerate strong sunlight. Use some hay or straw to loosely cover the tender plants during full sun or in the evening to protect from cool night temperatures. When they have acclimated to outdoor life, pull the straw away and use as a mulch to prevent moisture loss. 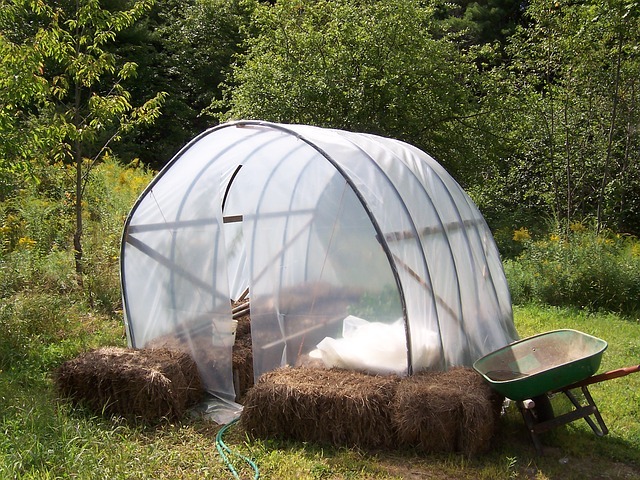 Use straw bales around the base of a makeshift greenhouse for some insulation. There Are Many Ways to Use Hay or Straw in the Garden! With such a versatile material, you are sure to think of some other uses for hay and straw in your garden. They make a nice place to sit back and admire your work. Use them as a decorative element for displaying your pumpkins in the fall. Straw mulch around those pumpkins helps to protect the bottoms from marauding slugs. Try a few bales from a local farmer who doesn’t mind answering your qeustions. As long as they are free of persistent herbicides and noxious weeds, bales of hay and straw make a great addition to the home garden! We are firm believers in using straw for our chicken run. Scattered around at about 1-2 inches thick, it gives our ladies some excitement, letting them scratch away during the cold months in search of little yummies. Cheers for sharing on the blog hop! I use straw in my coop, but the run is mostly grassy…except at this time of the year when there is so much mud! They do love to scratch in it! I am almost out and I need to pick up more. But now that I have read about the persistent herbicides, I will be much more careful about what I buy! I liked using old hay in my garden, but one year it hadn’t been left out long enough and the seeds sprouted in my beds. I thought I’d never get them weed free again. I used straw one year for my chicken coop. Maybe it was a coincidence but it was the one and only time my chickens ever came down with lice. The only thing that was different was the straw. I have had a problem with weeds from hay too. It was a tough lesson, but don’t put fresh hay out on my garden anymore. That is very interesting about the lice…I wonder if the straw was in a barn with pigeons roosting over it? Of course, there is no way to know…but it would be one explanation.